FOSTER CITY, Calif. – Feb. 12, 2019 – Qualys, Inc. (NASDAQ: QLYS), a pioneer and leading provider of cloud-based security and compliance solutions, today unveiled Patch Management (PM), a new Cloud App that provides automated patch deployment capabilities, enabling customers to transparently orchestrate full-lifecycle vulnerability management of operating systems and third-party software across global hybrid environments. 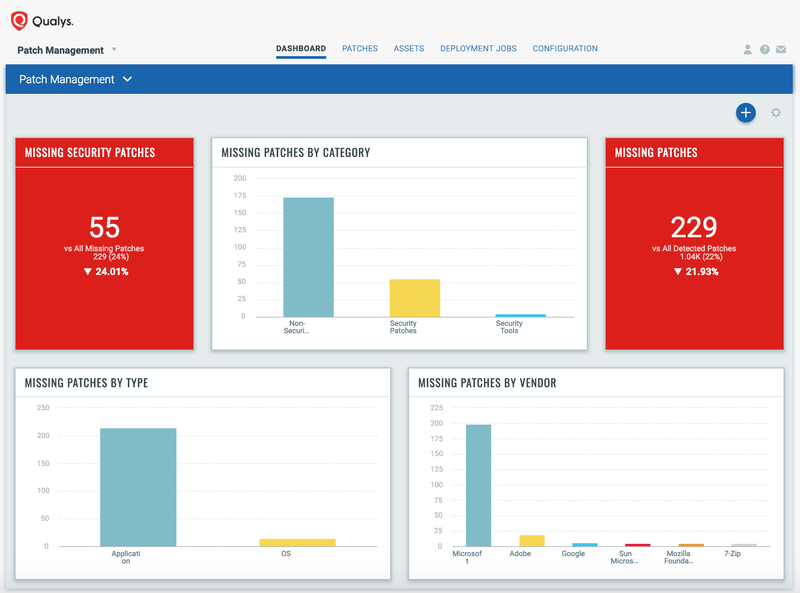 With Qualys PM, the Qualys Cloud Platform now consolidates vulnerability assessment, threat prioritization and remediation, allowing IT and SecOps teams to centralize remediation of vulnerabilities across Windows, macOS, and Linux operating systems, as well as over 300 third-party applications. Users can quickly target critical Common Vulnerability and Exposure IDs (CVEs) without researching knowledge base articles, then deploy the patch to endpoints, on-premises or cloud assets and verify remediation, all from one console. Qualys Patch Management centralizes patching and remediation for IT and security teams. Qualys PM can be activated instantly via the same Qualys Cloud Agent used for assessing vulnerabilities and configurations. This single agent continuously sends critical change event data and supporting details to the cloud and enables patch installation on remote and roaming endpoints outside the network. Once activated, Qualys PM continuously gathers and uploads telemetry about installed software, open vulnerabilities and missing patches to the Qualys Cloud Platform. The resulting shared visibility of assets and their posture enables IT and security teams to collaborate using common vulnerability-centric terminology and provides a consistent data set to analyze, prioritize, deploy and verify patches more efficiently. Patch deployments can be impacted by remediation windows or change management policies. Qualys PM allows teams the flexibility to run scheduled patches, approve new patches into existing deployment jobs for ongoing operational security, and create one-off jobs for emergency deployment of patches for high-profile vulnerabilities. Initial Qualys PM support will include Windows operating systems and more than 55 Windows and third-party applications. Future support will include Mac and Linux operating systems, expanded approval workflows and increased automation. Future versions of Qualys PM will feature unified reporting and visibility across all steps of the patching process, with separation of duties for specific tasks, in order to streamline processes and foster collaboration. Qualys PM will be generally available in March. Pricing starts at $29.95 per asset.